Huge congratulations to Grace and Paul who were married on Saturday 30th August at Forrester Park Golf and Country Club, Great Totham. This was the biggest wedding cake I’ve made so far! As Grace and Paul were serving the cake as their dessert the portion sizes are bigger, therefore the wedding cake has to be bigger! They had a four tier cake consisting of Madagascan Vanilla on the bottom, then Black Forest Cake, Lovely Lemony Lemon Cake and finally Carrot and Pecan for the top tier. I was also asked to supply 6 gluten free vanilla cupcakes too. 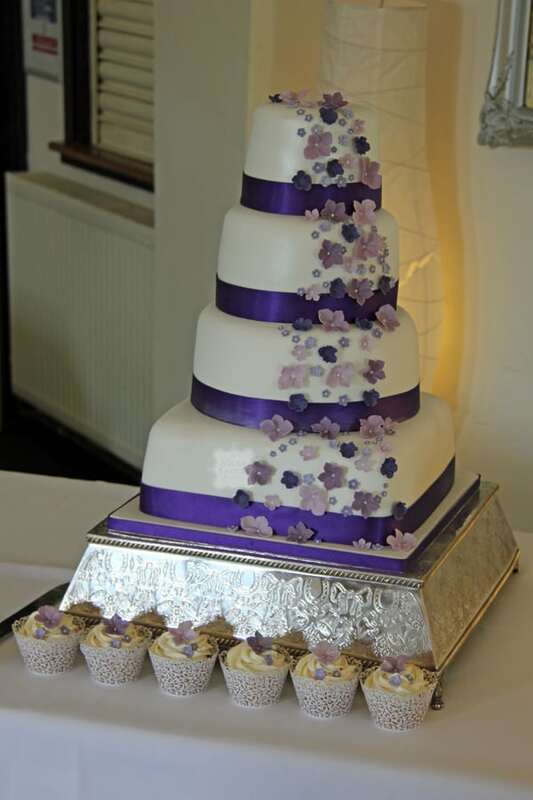 The cake was decorated in different shades of purple and lilac tumbling blossoms and the white icing was covered in a pearl edible lustre.